Sandisk has announced the world’s first solid state drive with a storage capacity of 4TB. 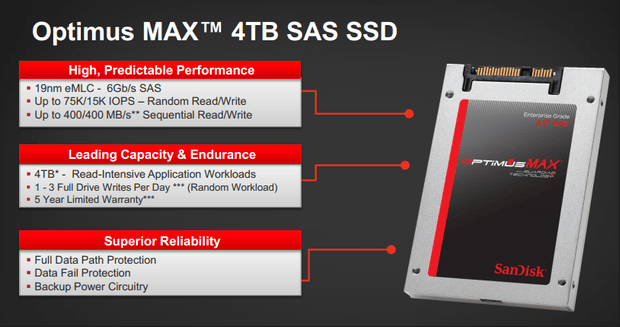 The new 4TB SSD will be a part of Sandisk’s Optimus MAX SCSI SAS series of SSD’s. Alongside the Optimus MAX series of SSD’s, Sandisk has also debuted the Lightning Gen. II range of SSD’s. Both the Optimus MAX and Lightning gen. 2 range of enterprise SSD’s are meant to serve the growing storage demands of data centers. The Optimus Max range of SSD’s are optimized for read intensive applications such as video streaming and web servers, whereas the Lightning gen. 2 range of SSD’s are both write and read optimized or a mixed use solution. “Customers have been looking for a way to transition their data centers from HDDs to NAND flash, but have been forced to decide between cost and performance, or give up important functionality. The Optimus MAX eliminates the need for compromises. We believe that the Optimus MAX will be a disruptive force within the storage industry, catalyzing many organizations to make the switch from their HDD-prominent data center infrastructures to SSDs,” said John Scaramuzzo, Senior Vice President and General Manager, Enterprise Storage Solutions at SanDisk. The main advantages of the new 4TB SSD’s include high performance, less power consumption and lower footprint requirement. Additionally since SSD’s are much smaller than 3.5 inch Hard disks, data centers switching to SSD’s will now require fewer racks and less power supply. The Optimus MAX series of SSD’s are going to be available via sales channel around the third quarter of 2014, However the Lightning Gen. II range of SSD’s will only be available through OEM around the same time. 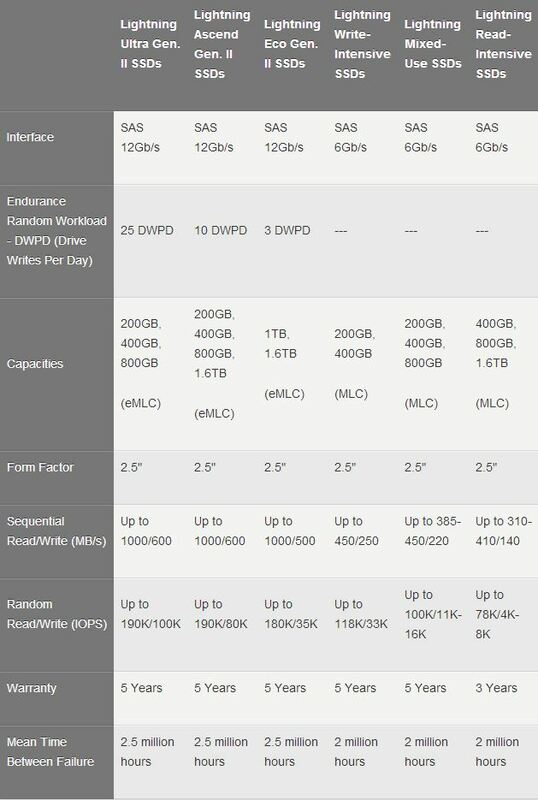 Sandisk is also going to launching SSD’s in both 8TB and 16TB variants. While the 8TB variant is expected to release by the end of this year, the 16TB SSD will be released next year. Here are the Tech. 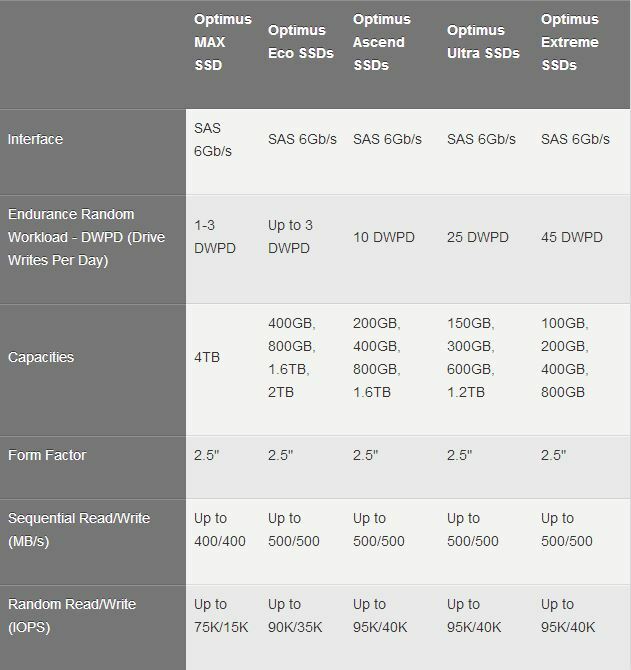 specs of the newly announced Optimus MAX and Lightning Gen. II range of SSD’s. Technical specification and warranty details of Optimus MAX range of SSD’s. Technical specification and warranty details of Lightning Gen. II range of SSD’s.